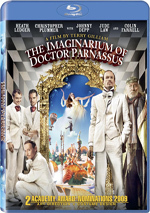 The Imaginarium of Doctor Parnassus appears in an aspect ratio of approximately 1.85:1 on this Blu-ray Disc. Don’t expect any problems from this top-notch presentation. Sharpness worked well. At all times, the movie exhibited good clarity and definition, without more than a smidgen of softness on display. No issues with jaggies or moiré effects appeared, and edge enhancement was minor. Source flaws failed to appear. Imaginarium went with a somewhat golden tint, and that affected its hues. The colors tended toward that side of things but still looked rich and full. Blacks were dark and dense, while shadows showed nice clarity. I felt wholly pleased by this excellent transfer. As for the DTS-HD MA 5.1 soundtrack of Imaginarium, it didn’t dazzle, but it opened up the settings in a satisfying manner. The fantasy sequences provided the most dynamic material, though some street scenes also brought out a lot of activity. These used the various speakers well and formed a vivid soundscape at the appropriate times. We didn’t get enough of them to make this a consistently involving track, but they added a lot to the package. How did the picture and sound of the Blu-ray compare to those of the movie’s DVD edition? For the most part, the audio was similar. I thought the DTS mix had a little more punch and power, but the differences weren’t significant. Visuals showed bigger improvements. For a standard DVD, that version actually looked pretty good, but the format’s limitations meant the Blu-ray came across with substantially stronger definition and clarity. The Blu-ray includes the same extras as the DVD along with a few new materials. I’ll mark exclusives with special blue print. The Artwork of Doctor Parnassus goes for four minutes, 30 seconds. It displays concept drawings while Terry Gilliam discusses the film’s visual concepts. He gets into the ideas well in this satisfying program. 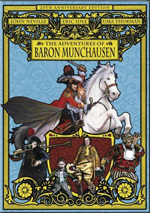 During the six-minute, 32-second The Imaginarium of Terry Gilliam provides notes from Terry Gilliam, Amy Gilliam, Hadida, Plummer, Garfield, Cole, Waits, Docherty, costume designer Monique Prudhomme, editor Mick Audsley, composers Mychael and Jeff Danna, and supervising sound designer Andre Jacquemin. The show looks at the nature of the production with an emphasis on visuals and Terry Gilliam’s influence. A few good notes emerge, but most of the show feels like little more than praise for the director. Next we find a multi-angle progression for a scene called “The Drunk”. This lasts two minutes, 12 seconds and allows you to skip through pre-viz/storyboards, blue screen footage, visual effects pass and final shots. One screen also lets you see all four at the same time. Programs like this offer a good look at the various stages, so this one is enjoyable. Lastly, Heath Ledger and Friends goes for five minutes, 46 seconds and includes remarks from Terry Gilliam, Hadida, Amy Gilliam, Waits, Prudhomme, Garfield, Cole, Plummer, makeup and hair designer Sarah Monzani, director of photography Nicola Pecorini, and actors Johnny Depp, Jude Law and Verne Troyer. This gives us some thoughts about working around Ledger’s death as well as an appreciation for the late actor. It combines those two sides in a satisfying enough manner. The disc opens with some ads. We get promos for Dear John, Not the Messiah (He’s a Very Naughty Boy), Chloe and The Young Victoria. These also appear under Previews along with clips for The Road, Defendor, Nine, Extraordinary Measures, A Single Man, Hachi: A Dog’s Tale, Bright Star, St. Trinian’s, An Education, By the People: The Election of Barack Obama, It Might Get Loud, Whatever Works, Coco Before Chanel, Soul Power, The Adventures of Baron Munchausen, Labyrinth and The Dark Crystal. The disc also tosses in the trailer for Imaginarium. Most of the world thinks The Dark Knight was Heath Ledger’s last flick. In truth, The Imaginarium of Doctor Parnassus was his final work, but it’ll serve his legacy better to remember him for his stunning turn as the Joker. Imaginarium is far from being a bad film, but it’s too inconsistent and flawed to become a good one. 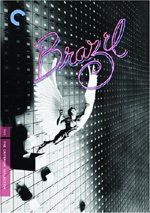 The Blu-ray offers excellent picture along with nice audio and a smattering of generally useful supplements. This is a pretty good release for an inconsistent film.